Previously published in Joint Archives Quarterly, Volume 23, Issue 02, Summer July 1, 2013. Hope College has witnessed over 150 years of faithful leadership. The College presidents have guided Hope through fires, floods, wars, and depressions. 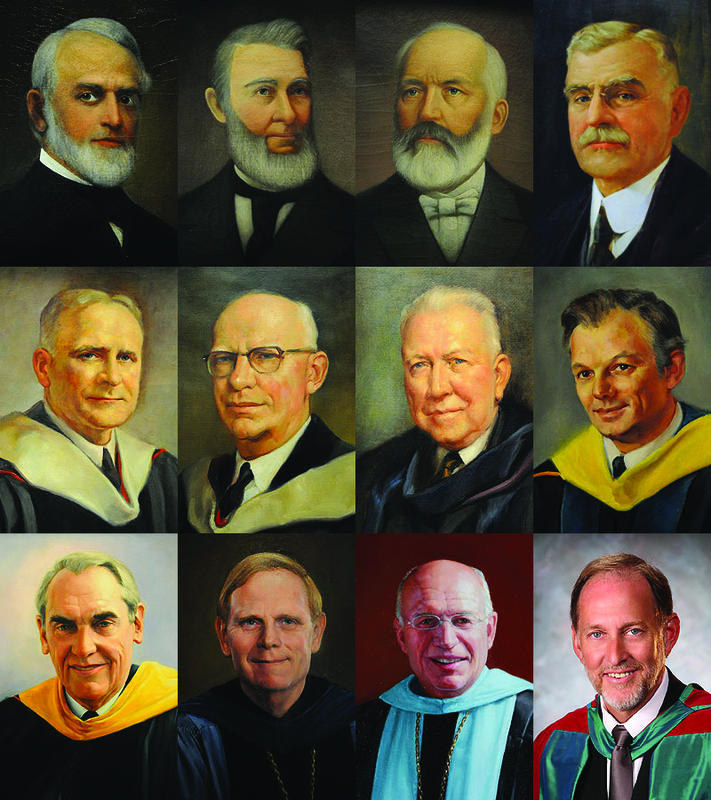 This history gives a brief, general overview of the eleven presidents of Hope who have served the college between 1866 and 2013 and made a lasting impact on the community, and introduces Hope’s twelfth president. In the founding days of Hope College, the first person to serve as president of the new school was Philip Phelps Jr. Born in New York on July 12, 1826, Phelps graduated from Union College, located in Schenectady, New York, in 1844 and from New Brunswick Theological Seminary in New Brunswick, New Jersey, in 1849. After ministering as a pastor for some years, Phelps was appointed as the principal of the Holland Academy in 1859. After the Civil War ended, Phelps, along with Holland founder Dr. Albertus C. Van Raalte, helped to start Hope College and was installed as Hope’s first president in 1866. Phelps’s administration was responsible for many important establishments during his term which ended in 1878. He personally helped students build Hope’s first gym and chapel in 1862. Phelps also welcomed the first Japanese students to Hope in 1869, as well as the first female students in 1878, which included his own two daughters. 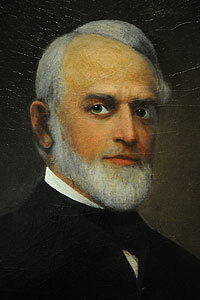 Hope’s second president, Charles Scott, was born in Little Britain, New York, on December 18, 1822. He graduated from Rutgers College in 1844, from New Brunswick Theological Seminary in 1851, and received his Doctorate of Divinity degree from New York University in 1875. From 1851 to 1866, he held a pastorate in New York, at which time he accepted a professorship at Hope College and continued to teach here until 1877. Scott was elected vice president of the college in 1878 after Phelps’s resignation in June. Giles H. Mandeville was appointed as provisional president at the same time, and served in that that role until 1880. 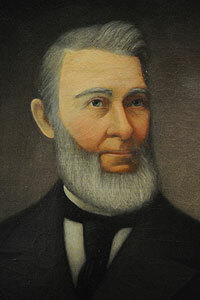 In June 1880, the Council of Hope College (later known as the Board of Trustees) appointed Scott provisional president. He held this post until April 1885, when he was elected president of Hope College. He was inaugurated in June 1886. Scott served as president until failing health forced him to tend his resignation to the Council in April 1892 and relinquish the office of president in June 1893 to Gerrit J. Kollen. Under Scott’s administration, The Anchor was established, and organized sports made their debut at the school. Throughout this time, church support was disrupted due to denominational secession troubles, and Hope struggled to make ends meet. According to one story, they even had trouble raising $50 to install lightning rods on the roof of Van Vleck Hall. When Scott passed away on October 31, 1893, the financial situation at Hope College was improving. Gerrit J. Kollen was a Dutch immigrant born in the Netherlands on August 9, 1843. After his father passed away in 1846, he and his family immigrated to Overisel, Michigan, in 1851. In 1862, he entered Holland Academy and later graduated from Hope College in 1868, making him the first Hope president to have also been a Hope student and first non-ordained president. For many years, he worked as a teacher in the Overisel area and then as an instructor in the Holland Academy, a grammar school at Hope College. In 1893, he became Hope’s third president. 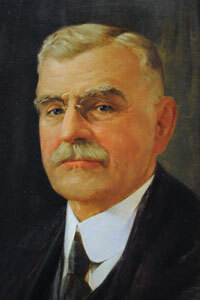 During his time in office, Kollen presided over the construction of Graves Library and Winants Chapel, Van Raalte Memorial Hall, and Voorhees Hall. Kollen proved to be a skilled fundraiser as well, whose greatest success was in convincing Andrew Carnegie—to whom he apparently bore some resemblance—to finance the construction of Carnegie Gymnasium. Of these buildings, Graves and Voorhees still stand. Van Raalte Memorial Hall was destroyed in a fire in 1980, and Carnegie Gymnasium was demolished in 1982. Born on May 25, 1857, Ame Vennema was the first of Hope’s presidents to have been born in Holland, Michigan. He attended Hope Preparatory School and Hope College, graduating in 1879, and later graduated from New Brunswick Theological Seminary in 1882. After pastoring a number of churches, Vennema was appointed to the Council of Hope College in 1905, and in 1911 he began serving as the fourth president of Hope College. Among the changes he made at Hope was a relaxation of travel restrictions for athletic teams. When Vennema was installed as president, he inherited a policy that banned ever-more-popular athletic teams from traveling during school terms. In 1913, following policy with faculty support, he suspended the men’s basketball team for violating this rule, and the students reacted by striking— a shocking move for the day. Giving due attention to the wishes and best interests of the students, Vennema was eventually able to ease these restrictions. Besides this achievement, the initial years of Vennema’s administration saw a significant increase in enrollment, as well national recognition of the school by the North Central Association of Colleges and Secondary Schools in 1916. However, following the nation’s entry into World War I in 1917, enrollment dropped as many Hope men left to enlist. This event occurred just one year prior to Vennema’s resignation in 1918. Following Vennema’s administration, Edward D. Dimnent, born in Chicago on August 14, 1876, was appointed Hope’s fifth president. As a young man, he entered Hope Preparatory School in 1888 and graduated from Hope College in 1896. In 1898, he returned to Hope as a professor of Greek and also worked as the school’s registrar and treasurer at various points. In 1918, Dimnent was elected president of Hope College. Dimnent’s administration was responsible for the implementation of the Student Army Training Course and the change in the overall academic year to a two-semester schedule. Dimnent was responsible for the construction of the Hope Memorial Chapel, which was completed in 1929 and renamed Dimnent Chapel in his honor in 1959. Rumor has it that Dimnent even paid the remaining debt for the chapel himself when the Great Depression hit towards the end of his administration. In 1920, Hope College began charging tuition for the first time—$35 per student per year. Dimnent remained long enough to see the first annual Tulip Time festival in 1930. He resigned in 1931 and returned to teaching, as well as continuing his own education at Western Theological Seminary, and was ordained in 1935. Hope’s next president faced many challenges yet initiated great changes through both the Great Depression and the World War II years. Wynand Wichers was born in Zeeland, Michigan, on February 15, 1886. He graduated from Hope Preparatory School in 1905 and from Hope College in 1909. Wichers was first appointed as an instructor in English and Latin at Hope Preparatory School and later, in 1913, he became a professor of history at Hope College. In 1925, Wichers resigned from his Hope professorship to work as a cashier of First State Bank of Holland. Though he no longer taught, Wichers continued on the Board of Trustees of Hope. 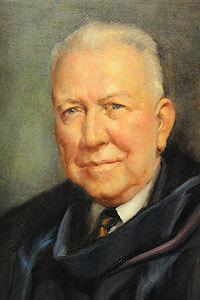 Then, in 1931, Wichers was elected as the sixth president of Hope College. During the Great Depression and World War II, Wichers brought in the Army Specialized Training Program, which kept the school running during a time of low enrollment. Yet despite financial struggles of that era, Wichers also introduced a number of wonderful traditions such as the May Day festivities, the AllCollege Sing, and the Nykerk Cup competition, a popular event which continues to this day. Wichers’s administration was responsible for the construction of the science building, now Lubbers Hall, which provided the first modern laboratory facilities on campus. In 1945, Wichers resigned as president of Hope. Nevertheless, he retained close ties with Hope College, and in 1969 published a book on Hope’s history called A Century of Hope in honor of its centennial celebration in 1966. Irwin J. Lubbers, born in Cedar Grove, Wisconsin, on November 15, 1895, was Hope’s next president. Graduating from Hope College in 1917, Lubbers joined the U.S. Air Force in 1918 and afterwards worked in the Reformed Church Mission at Vellore, India, for four years. In 1923, he returned to become an instructor of English at Hope College. In 1931, Lubbers received his doctoral degree from Northwestern University—which made him Hope’s first president with a Ph.D.—and moved to Pella, Iowa, where he became president of Central College in 1934. 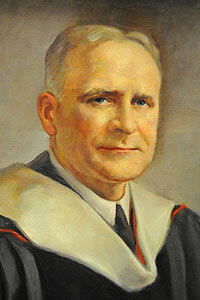 Then, in 1945, Lubbers returned to Hope to serve as the college’s seventh president. Lubbers’s administration was similarly fastpaced. 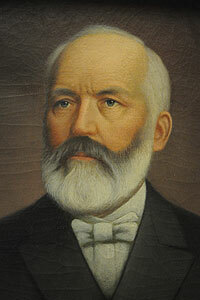 He presided over numerous changes, including the construction of Durfee, Kollen, Phelps, and Gilmore residence halls; the Nykerk music building; the Van Zoeren Library; a heating plant; a fraternity complex, which would later become Cosmopolitan, Scott, Lichty, and Wyckoff Halls; the renovation of Carnegie Gymnasium and Graves Hall; and the initial construction of Vander Werf Hall. This extensive construction program was needed as enrollment jumped to 1,300 following the end of World War II in 1945 and the return of student veterans. Lubbers also started the tradition of presidential luncheons with students and founded the Vienna Summer School program in 1956. Before his retirement in 1963, Lubbers saw Hope named one of America’s top ten co-ed colleges by The Chicago Tribune in 1957 and saw the city of Holland and Hope College graced by a visit from Queen Juliana and Prince Bernhard of the Netherlands in 1952. Born in Friesland, Wisconsin, on January 2, 1917, Calvin A. Vander Werf was another in the tradition of Hope grads serving as Hope presidents. After having graduated from Hope College in 1937, he earned his doctorate at Ohio State University in 1941, and the same year joined the chemistry faculty of the University of Kansas. In 1963, he returned to Hope as the college’s eighth president. Vander Werf’s advocacy of Hope’s research-based model for science played a vital role in developing the strong reputation Hope’s program enjoys today. Vander Werf’s administration led the way in forming the 4 exchange program with Meiji Gakuin University in Tokyo, as well as several construction projects including the Physics-Math building (later renamed Vander Werf Hall in 1980), Dykstra Hall, and the De Witt Student and Cultural Center. After his resignation in 1970, William Vander Lugt served as chancellor during the search for a new president. 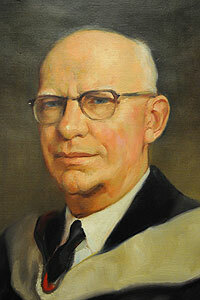 Gordon Van Wylen, Hope’s ninth president, attended Calvin College and the University of Michigan, completing his doctorate from Massachusetts Institute of Technology (MIT) in 1951. Prior to that time, Van Wylen worked for duPont and served in the Navy. He also taught at Penn State University and the University of Michigan, where he became the dean of the mechanical engineering department in 1965. In 1972, he began to serve Hope College as president, and during his administration many more additions to campus facilities were achieved. 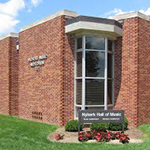 Van Wylen presided over the construction of the Peale Science Center, DePree Art Center and Gallery, Dow Physical Education and Health Center, College East apartments, Maas Conference Center, and library that was named in his honor. He also established a provost-dean structure for a better academic administration and began the tradition of the Critical Issues Symposium. According to the Joint Archives of Holland records, Hope in the 1970s was characterized by a certain ambivalence concerning its character. Van Wylen played an important role in crafting a mission statement to help make Hope’s focus emphasize academic excellence in a Christian context. When Van Wylen retired in 1987, John H. Jacobson took his place of leadership. Born in Evanston, Illinois, on November 6, 1933, Jacobson was a graduate of Swarthmore College and Yale University. 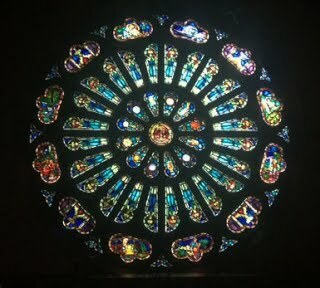 For some years, he taught at Hamilton College in New York, then moved to Florida to teach at Florida Presbyterian College (now Eckerd College). 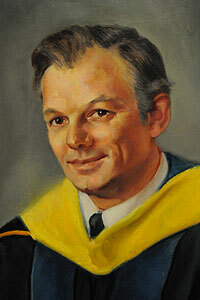 In 1968, he became the vice president for academic affairs and the dean of the faculty there. 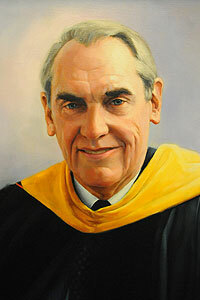 In 1972, he moved back to New York and became Dean of the Rochester Center of Empire State College. 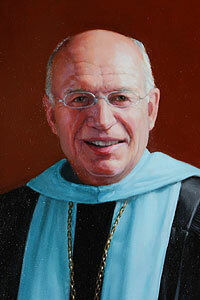 Between 1972 and 1986, he was also appointed vice president, provost, and the acting president twice at the school. Finally, in 1987, he came to Hope and served as Hope’s tenth president. Under Jacobson, Hope’s endowment increased from $20 million to $105 million, and enrollment jumped to over 2,900. Also during Jacobson’s administration, Hope became the only private, four-year, liberal arts college in the country to have national accreditation in art, dance, music, and theater. Jacobson oversaw the renovation of the Knickerbocker Theatre, Lugers Fieldhouse, De Witt Tennis Center, Haworth Inn and Conference Center, and Cook Hall on Hope’s campus. Moreover, before his retirement in 1999, Jacobson had made a great impact on the college in how he helped craft the campus ministries program, and through his commitment to the multicultural life of the college and the promotion of diversity. Graduating from Hope College in 1963, James E. Bultman earned his master’s and doctoral degrees from Western Michigan University. In 1968, he taught at Hope College in the department of education, serving as chairperson of that department from 1976- 1982, and after that as dean of the social sciences from 1982-1985. Bultman was also Hope’s head baseball coach from 1971- 1985 and the assistant football coach from 1970-1984. 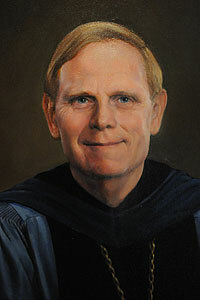 In 1985, he left Hope for the presidency of Northwestern College in Iowa. In 1999, Bultman returned to serve as the eleventh president of Hope College. During the fourteen years Bultman held this office, he led Hope through many important changes. Since the beginning of his term, enrollment steadily grew to more than 3,200 students. During his presidency, Bultman launched “Legacies,” the largest fundraising effort in the college’s history, which has led to the construction of the A. Paul Schaap Science Center, the DeVos Fieldhouse, the Martha Miller Center, the Van Andel Soccer Stadium, and the Tom and Ryan Cook Village, as well as the renovation of the Peale Science Center, Lubbers Hall, and the restoration of Graves Hall and Winants Auditorium. Bultman’s development of the Center for Faithful Leadership and the Crossroads Project also mark 4 5 beneficial additions to Hope life. But perhaps more important than the finances, Bultman left a personal legacy through the relationships he fostered with the student body. Both he and his wife, Martie, attended student performance and games regularly, as well as frequently inviting students to the President’s Home. 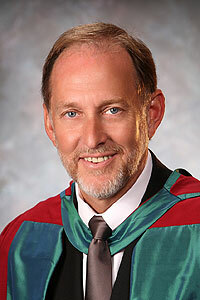 Bultman retired from the presidency in 2013. The twelfth president of Hope College, John C. Knapp, is a graduate of Georgia State University, Columbia Theological Seminary, and earned his Ph.D. at the University of Wales. An internationally known speaker and seminar leader on morality and ethics in education and leadership, Knapp has traveled extensively. Previously, he was the founding director of Samford University’s Frances Marlin Mann Center for Ethics and Leadership in Birmingham, Alabama, since 2008. Before joining Samford, Knapp was professor and director of the Center for Ethics and Corporate Responsibility at Georgia State University’s J. Mack Robinson College of Business. As the twelfth president of Hope College, Knapp joins a long line of dedicated, faithful leaders of Hope. During Knapp’s leadership, changes on campus include the addition of the Haworth Engineering Center; the construction of the Kruizenga Art Museum; and the construction of the Jack H. Miller Center for Musical Arts. Hope College Dance Department Nykerk Hall Dimnent Memorial Chapel Philip Phelps Jr.